The capability approach of Martha Nussbaum and Amartya Sen places human capabilities at the centre stage of discussions about justice, equality, development and the quality of life. It rejects too much emphasis on mere preference satisfaction or resource provision and highlights the importance of human agency and freedom. This approach has already significantly influenced different fields of application, such as economics and development studies. Only recently have scholars started to explore its relevance for and application to the area of technology and design, which can be crucial factors in the expansion of human capabilities. How does technology influence human capabilities? What difference could a capability approach make to policies and practices of applying ICT in development processes in the South? How can we criticize and improve the design of technology from the perspective of the capability approach? 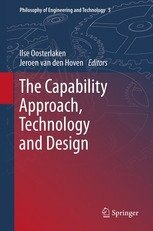 The authors of this volume explore the implications of the capability approach for technology & design and together create the first volume on this emerging topic.